Mr. Potato Head has a new alter ego. He’s part-robot, part-potato and he’s crossed over to the dark side. He’s Darth Tater, Hasbro’s latest offering, created to promote the next Star Wars film: Star Wars: Episode III – Revenge of the Sith. 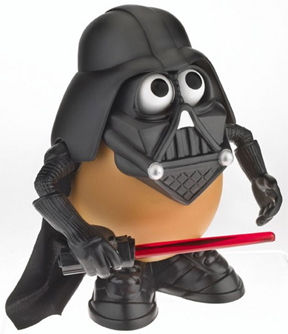 Darth Tater comes with many "silly parts" including a light saber (for fighting Obi-Wan Potato? ), a cape and helmet as well as the obligatory shoes, eyes, mouth and teeth. "Kids will be able to have all kinds of mix ‘n match, Mr. Potato Head fun with this wacky spud dressed as the infamous Star Wars saga villain, Darth Vader," according to the company. The scary spud will be available in stores February, months before the film’s May 19 release date and will retail at $7.99. For those who can’t accept Mr. Potato Head’s dark side, all I can say is, your lack of faith is disturbing.